As part of a three-day state visit by the Head of State of Qatar, talks on economic topics are mainly planned. 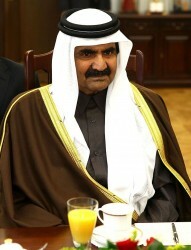 The sheikh of the Arab emirate of Qatar in the Persian Gulf, Hamad Bin Khalifa Al-Thani arrives on Thursday for a three-day state visit to Austria. Planned are meetings with the Austrian President, Heinz Fischer, the Minister of Economy, Reinhold Mitterlehner and the President of the Economic Chamber, Cristoph Leitl.